Every once in a while I am asked to consult on problems with my Google Shopping campaign segmentation strategy. The problem is always the same: Queries end up in the wrong campaigns, making people question whether the strategy still works. As it turned out time and again, problems are either caused by targeting mismatches or limited budgets. Note: It doesn’t matter whether this is done with two or three campaigns. The actual reason for this phenomenon is that the “skipped” campaign wasn’t there to “catch” the query. This happens if the campaigns don’t cover the same things. For example, if the second campaign has a mobile bid modifier of -100 %, it will only catch queries from desktop and tablet devices. So if the other campaigns cover all devices, mobile queries will have to skip the second campaign (as depicted above in scenario 1). As a result, all queries that would otherwise have been caught by the first campaign, will end up in the second one. To a marketer looking at search queries it will seem as if some queries randomly slip through. Unless they happen to segment queries by device, it’s hardly possible to realize that only mobile traffic is affected. Note that all of the above may have bid modifiers. Different bid modifiers are no problem unless one of them is -100 % (which would affect targeting). Since negative keywords are used to segment queries into the different campaigns, you cannot simply add new negatives as you would do in other campaigns. For example, if you just exclude an unwanted term in the highest priority campaign, you would “promote” those queries to the next campaign. A better way to handle regular negatives is to put them on a negative keyword list and apply it to all shopping campaigns. The problem with product coverage is a bit more complicated. An identical product coverage is basically the foundation of the whole segmentation strategy. It’s important to understand that campaign priorities are not used to simply give one campaign precedence over another. 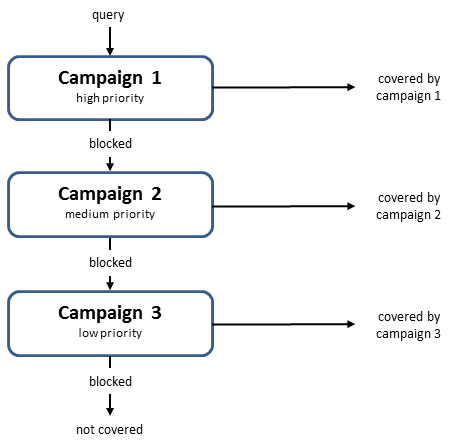 In the chart above, notice that product Y is only covered by the low priority campaign. This is exactly the kind of mismatch that leads to campaign 2 receiving all queries of this product. In order for a matching product coverage in all campaigns, it is usually enough to make sure that the same campaign level inventory filters are used and the same products are excluded everywhere. The easiest way to ensure this is, of course, to not exclude any products at all. While targeting issues can be fixed, budget issues have proven more difficult in the past. The problem is basically the same: If a campaign runs out of budget, queries may skip it and end up in the wrong campaign. For the remainder of the day, all general queries go to the brand campaign. Due to higher bids (which were intended for valuable brand queries), the campaign is eligible for impressions from additional general queries. Additional traffic and higher bids lead to a much faster budget consumption. The campaign runs out of budget and there’s a third campaign with even higher bids. The second or third campaign has a much higher budget since they were supposed to capture valuable traffic only. With the shopping campaign segmentation, marketers can’t have individual limited budgets, which is why I used to strongly advise a shared budget for all affected campaigns. Unfortunately, this alone no longer helps. Even though, logically, a shared budget should solve the problem, it doesn’t. When a shared budget is nearly exhausted, queries start to slip through. The higher bids then lead to more budget consumption, making it worse. When we first encountered the problem in 2015, we tried switching to accelerated delivery, which had no effect. We asked Google and to our surprise they agreed that this shouldn’t happen. However, since no one else had this problem, they told us it wouldn’t be a priority to fix it. I was under the impression that they had actually gotten around to it, but recent data from a client suggests otherwise. In practice, this is probably what most advertisers do anyway. It also explains why few people ever experience problems due to limited budgets. There was a time when I feared that the segmentation strategy would only work until Google finally decided they didn’t like it. Other people often came to me, suspecting that this had happened. However, by now too many advertisers are building their campaigns this way, so that it is unlikely for Google to just change the rules. Chances are, if you see queries ending up in the wrong campaign, it’s because one of the reasons described above. Otherwise – let me know!